In preparing a golf course appraisal report, it is important to have the latest golf course sale information available. Hotel & Leisure Advisors collected and analyzed listings for sale of 80 golf courses located in 29 states in the summer of 2012. 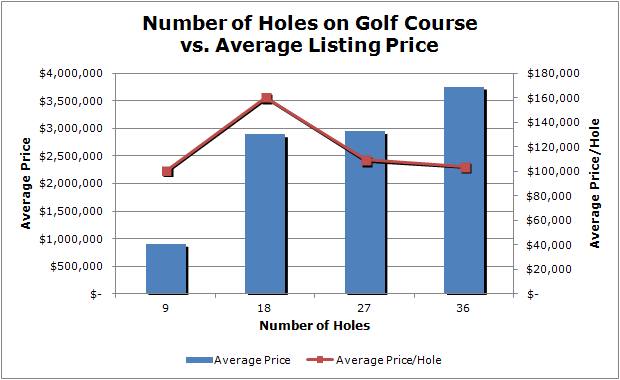 This article focuses on the average 18-hole price equivalents of the listing price and average price per hole in relation to the geographical location, type, number of holes, and amenities offered by the golf courses. The number of golf facilities nationwide dropped to 14,791 in 18-hole equivalents at year-end 2011, according to the National Golf Foundation (NGF). This is the third straight year the numbers have declined. Although only a 0.8% decrease from the previous year, it is the lowest total since 2002. The following table highlights the supply of golf courses in the U.S. from the year 2002 through 2011. Numbers are in 18-hole equivalents. 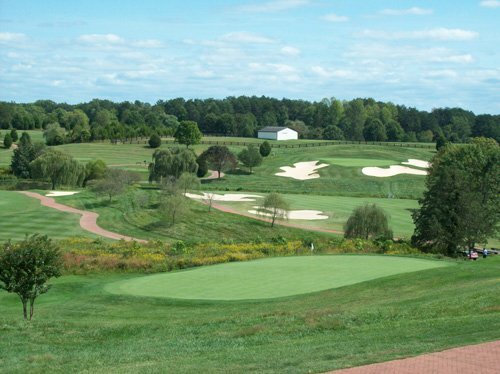 The supply of golf courses is most plentiful in the East North Central and the South Atlantic regions of the U.S., while the sparsest supplies are found in New England and the East South Central regions. Four out of the top 10 states are located in the East North Central region (Michigan, Ohio, Wisconsin, and Illinois), while two are in the South Atlantic region (Florida and North Carolina) and two are in the Middle Atlantic region (New York and Pennsylvania). After reaching a peak of nearly 400 18-hole equivalents in 2000, the number of openings has declined each subsequent year. According to the National Golf Foundation, only 19 new golf courses opened in 2011. The net growth of golf courses in the U.S. has been negative since 2006, as closures outstripped openings. This downward trend is primarily due to oversupply and the nationwide downturn in the economy. Furthermore, the downward trend is evidenced by a slowing of golf course construction and an increase in course closings. This downward trend has also impacted list prices of golf courses. The following discussion will highlight our findings from recent golf course listings that we collected. We have analyzed the average listing price and price per hole based on each region of the United States. The following graph compares the Northeast, Midwest, South, and West regions. With an average list price over $3,700,000, the West region has the highest value compared to the Northeast, Midwest, and South regions. The Northeast and Midwest regions are similar in price, $1,800,000 and $1,900,000 respectfully. This is primarily due to greater supply of golf courses in the Northeast and Midwest regions. Golf courses are classified as either public, private, or semi-private. A public golf course is open to the public and has no memberships; a private golf course is restricted only to paying members; and a semi-private golf course is open to the public, but also sells memberships. 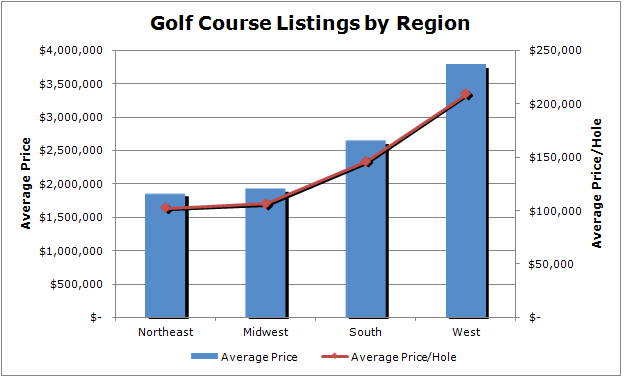 The following graph compares average listing prices for each of the three types of golf courses. 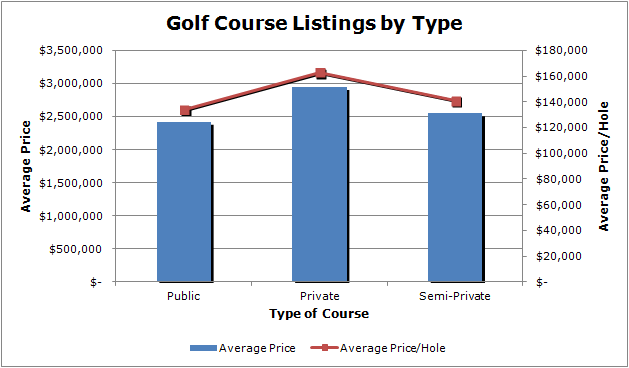 The above graph indicates that private golf courses are priced higher than semi-private and public courses. Private golf courses are listed for just under $3,000,000 on average ($160,000 per hole), while semi-private and public golf courses are similar in price at $2,500,000 ($140,000 per hole) and $2,400,000 ($130,000 per hole) respectively. A typical golf course is 18 holes, but they can also come in other variations such as 9-, 27-, and 36-hole golf courses. The following graph describes the difference in prices for each of the four different sizes. The above graph indicates that the average list price per hole of an 18-hole golf course is higher than 9-, 27-, and 36-hole golf courses. Many golf courses offer other amenities such as putting greens, driving ranges, restaurants, and pro shops where golfers can buy equipment. The following graph shows the average price of golf courses compared to whether or not they offer a certain amenity. 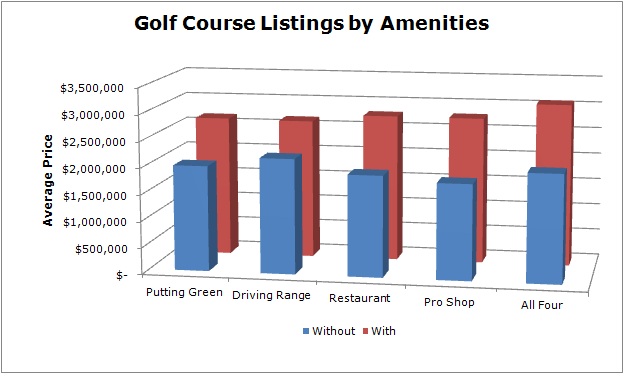 The above graph indicates that if a golf course offers a certain amenity, then the listing price is higher than if they did not offer it. A pro shop has the greatest impact on the price, followed by a restaurant. The chart below shows rounds statistics from 2000 through 2011. The number of golf rounds played in the United States has been slowly declining almost every year since 2000 (with the exceptions of very slight increases in 2004 and 2006). Demand for golf is expected to improve in 2012 due to the warmer weather nationwide. However, surveys of golfers indicate that they are playing fewer rounds due to the economic slowdown. 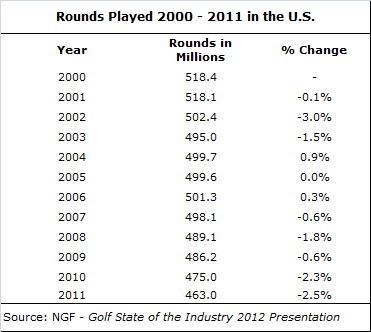 Overall, golf rounds declined 2.5% in 2011. List prices and sale prices of golf courses are directly related to the number of rounds played and the financial performance of the golf course. Our study of list prices of golf courses in the United States indicates a wide range of list prices. Not surprisingly, our research indicates that the price per hole of a golf course with multiple amenities is higher than that of a golf course without amenities. However, it was interesting to find that the list price of an 18-hole golf course on a price per hole basis is higher than 9-, 27-, and 36-hole golf courses. Author: Nuresh Maredia is a hospitality consultant and appraiser and has completed assignments in over 30 states. He has a wide range of experience in operations in hotels and resorts. Since joining Hotel & Leisure Advisors, Mr. Maredia has completed over 100 studies. 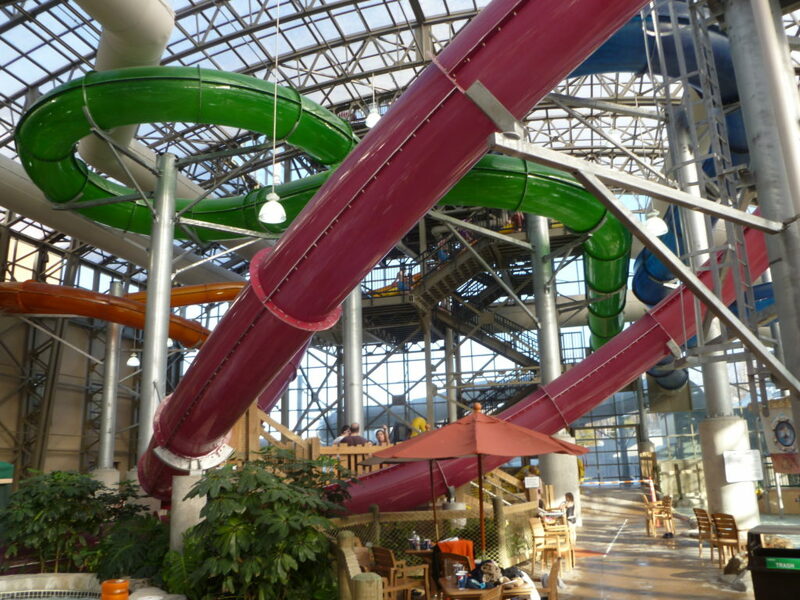 He has generated appraisals, market feasibility studies, economic impact studies, and hotel impact studies for a wide variety of leisure and hospitality-oriented property types including golf courses, hotels, waterparks, amusement parks, ski resorts, family entertainment centers, timeshare resorts, and other leisure real estate. He obtained his Bachelors in Finance and Masters in Hospitality Business from Michigan State University. He is a state certified real estate appraiser. The author wishes to thank Michael Nickerson, our 2012 summer intern from Michigan State University’s School of Hospitality Business, for his assistance on the article. Nuresh Maredia can be reached via telephone at 216-228-7000 ext. 24 or via e-mail at nmaredia@hladvisors.com.